Something a little different than the normal home game room stuff I post, I wanted to show what you can do if you have an outdoor building. When I built it originally, it had no insulation and a concrete floor. Problem was, it would get extremely cold during the winter and very damp in the spring due to condensation, which would cause the concrete to become slippery sometimes. After a couple years, I decided to get the inside insulated and have some electric heaters installed. I went back and forth between gas and electric heating but eventually went with electric for air quality reasons. I figured that if I was going to play basketball in there with the heater going, air quality was probably slightly more important than if I was just working on cars out there. I’m sure some gas heaters are less smelly than the ones I’m used to, but it was just easier to go electric and not fool with it. Once I got the inside finished, the flooring was next. 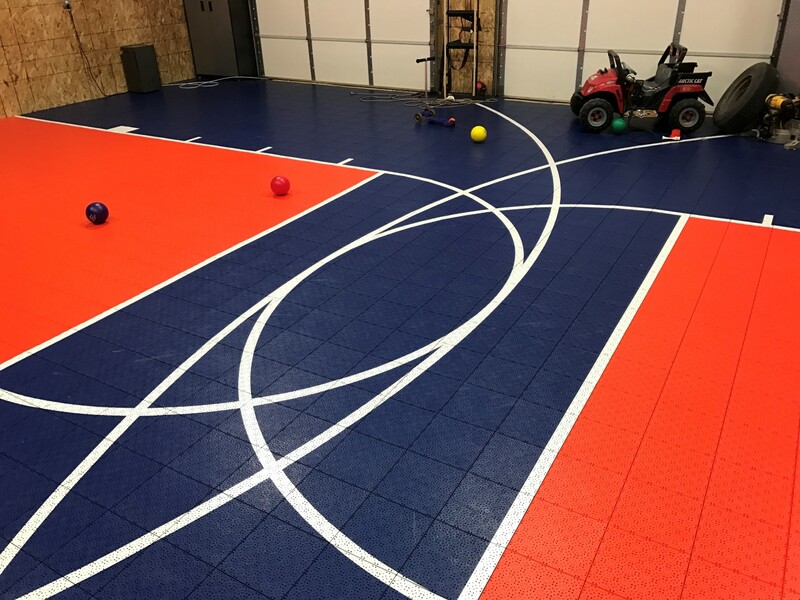 I looked at a lot of sport court flooring manufacturers but eventually went with Versacourt because they had a nice product, were responsive to emails, and would allow me to install it myself. 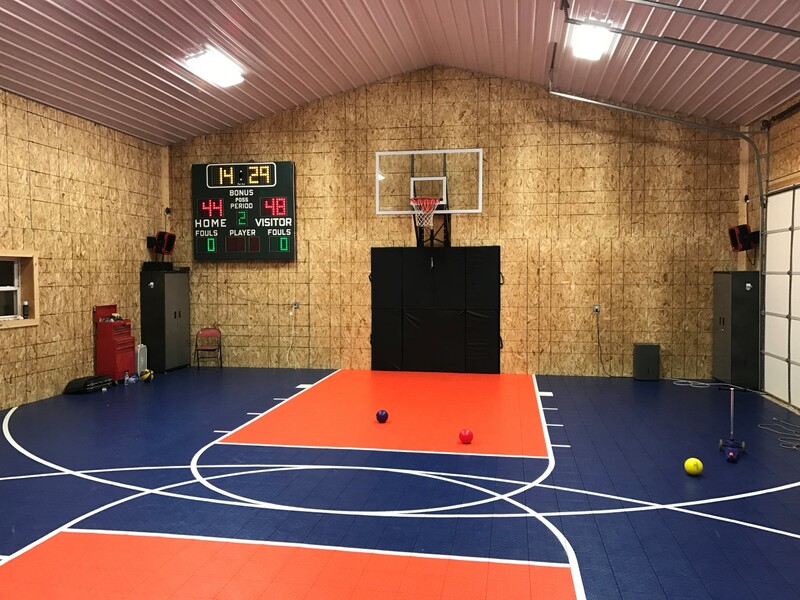 I think Sport Court is usually the most popular brand of sport tile flooring but they don’t allow you to install it yourself, making it not an option for me. Plus it was going to more expensive, and when you’re on a budget like I am then I needed to save on installation costs. Unfortunately my shed at 44 x 36 was just a little too short to have the 3 point lines not intersect. I think if I had to do it again I would have built the shed a little longer but I was also constrained by lot space. When I got the floor installed, my father found a good deal on an old scoreboard from a school that had upgraded. It doesn’t get used a huge amount but there’s no denying the cool factor it brings. 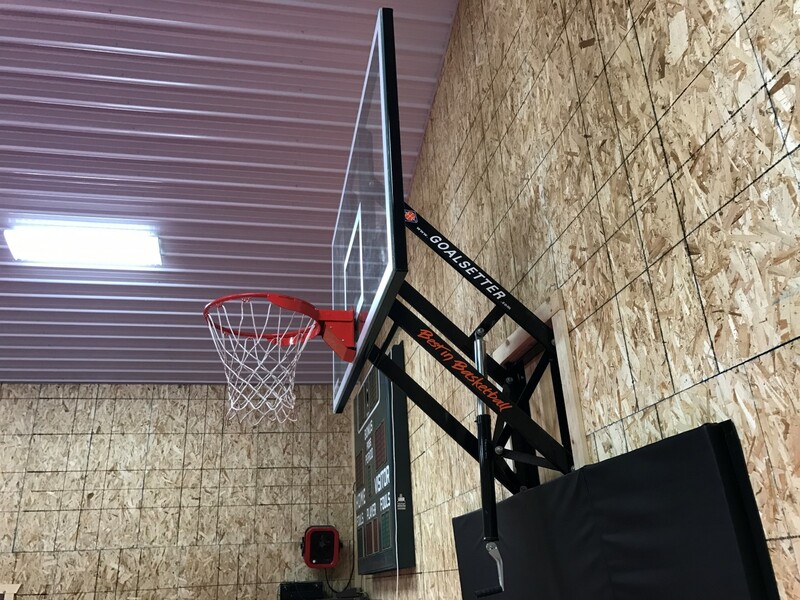 The basketball goal and mount are from Goalsetter. I originally bought the goal off Amazon right after I built the shed. The goal is very heavy and hard to mount, I had to get a truck bed with a couple of guys to get it mounted. It’s adjustable up and down but frankly it’s kind of hard to raise so I wouldn’t plan on doing it much unless you get some kind of motorized option with it. Previous articleHow much room do you need for a Foosball table? I’m looking to build the same sort of structure with almost the same footprint. I probably will only use a half-court setup. Would you mind answering a couple of questions? 1) What is your ceiling height and pitch? Height of side walls? 3) Is the roof insulated or just the walls? Do you think garage door insulation would help? 4) If you don’t mind, would you be able to provide the approximate cost of your whole set up including your steel shed and foundation? thanks so much for any help you could offer! My ceiling height at the walls is 14′. In the middle where the ceiling arches up it’s around 18′ I believe. 2 of the heaters are 30 amp and 1 is 20 amp, in the midwest where I live it heats up the building in about an hour when it’s pretty cold out. However, in New England, I’m not sure if it would be enough or not. You would either have to have additional heaters or a different heating agent. The roof is insulated along with the walls. Garage door insulation would definitely help, but the biggest thing is making sure that your garage doors don’t leak air along the sides. The shed is 44 x 36 and cost around $45k for the concrete, electrical, etc. 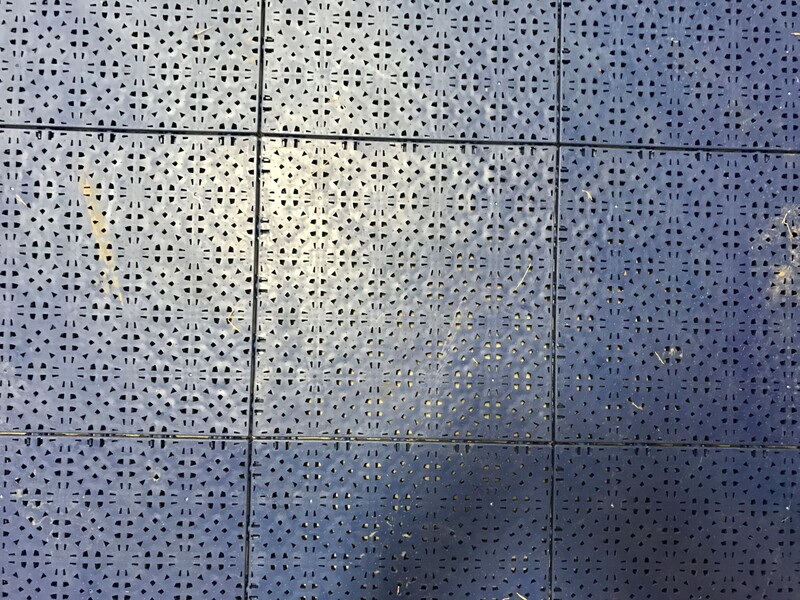 The finishing of the walls and ceiling was another $10k, and the floor tile was around $6k. So not cheap, but originally it wasn’t going to be a basketball court, it was going to be a shed for other things. Hopefully all that information helps!